Great gift givers give batteries. There are few things more frustrating to a child than opening a cool toy and discovering it's powerless, and won't do it's thing until the adults can duck out and buy the appropriate batteries. I LOVE to see brightly colored gifts with a pack of batteries taped to the outside. That's a way cooler gift topper than a bow! I've dug Crayola since I was a child myself, and my husband could be the poster child for Energizer. As a location sound engineer he goes through literally thousands of batteries a year working on TV shows, documentaries and movies. So, I was pretty jazzed to be invited to a “Power the Creativity” event where Energizer and Crayola teamed up! When I walked in and saw all the cool, light up, glow in the dark fun they had assembled for the blogger kids I exclaimed "I wanna play with the art too!" Happily, they reassured me I could! All of my husband's mics and gear run on batteries, and all the ones that aren't giant rechargeable bricks are Energizer Ultimate Lithium. He's super brand loyal because they're the best, and when he's shooting in the field, there are no retakes. He's got to know his gear will work or he won't. This dependability and quality isn't just for the pros. Who really enjoys undoing all those minuscule toy screws any more often than absolutely necessary?! Energizer now last longer than ever--try up to 10 years on shelf! Energizer Max Batteries with Power Seal Technology are the ones with staying power. 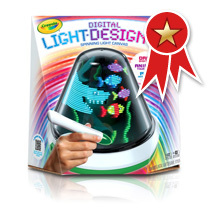 At the party we all got to check out Energizer Flameless candles, with a realistic flicker and sweet scents, and creative Crayola toys all powered by Energizer Max Batteries. The candles are more realistic and appealing than others I've seen. It's reassuring they're safe to leave glowing when you leave a room, or have little ones around. 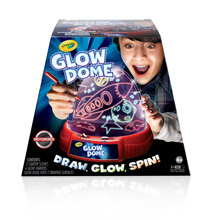 It was so much fun to check out some of Crayola's hot offerings for the 2012 holidays like the Glow Book, Glow Dome, Digital Light Designer, Marker Airbrush and more! We were thrilled to bring home a Crayola Light Up Tracing Pad and a packet of mind blowing Color Wonder Metal Effects Kit! Both were huge and immediate hits and make our highly recommended toys list. 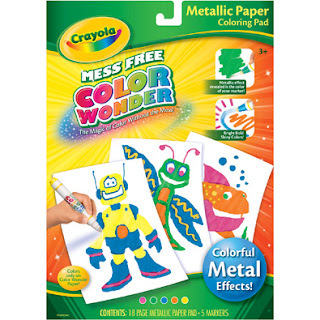 We've dug Color Wonder for years, for those situations where art supplies are a fun way to pass the time, but Grandma's cream carpet isn't as marker friendly as home. But we've never seen Color Wonder like this! These works of art seriously look metalic. They're quite impressive and fun. Check out my 9 year old daughter's Color Explosion Metallic creations right here. 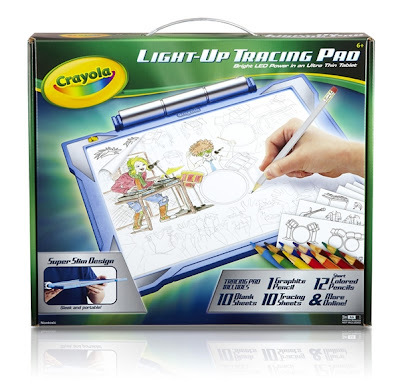 Crayola art supplies make ChiIL Mama's Great Gifts List. They encourage creativity, fine motor skills, and group play. Their crayons still rock...but Crayola has gone waaaay above and beyond. Check out their cool collection of art gadgets and supplies for art lovers of all ages on your gift list. Buy specially marked packs of Energizer® MAX® AA-16 and AAA-16 batteries and save up to $20 on select Crayola® products! Look for your coupons inside. For more information on Energizer, check out their main site here and follow them on Facebook for great deals. "I wrote this review while participating in a campaign by Mom Central Consulting on behalf of Energizer. 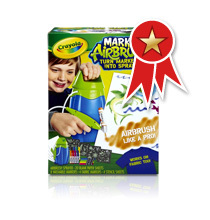 I attended an event and received a promotional item to thank me for my participation."